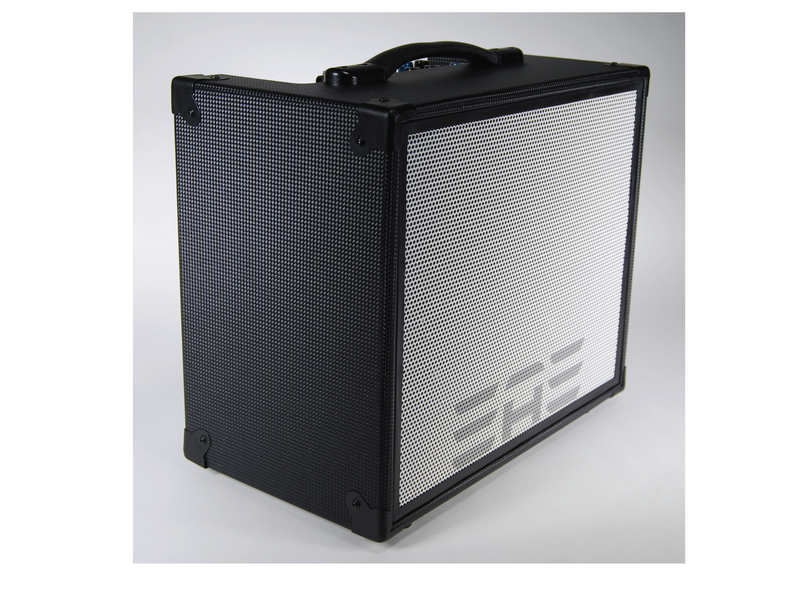 The EAE A655 100 Watt Rechargeable Stereo Acoustic Instrument and Vocal Amplifier offers 6 input channels with extensive mix control. 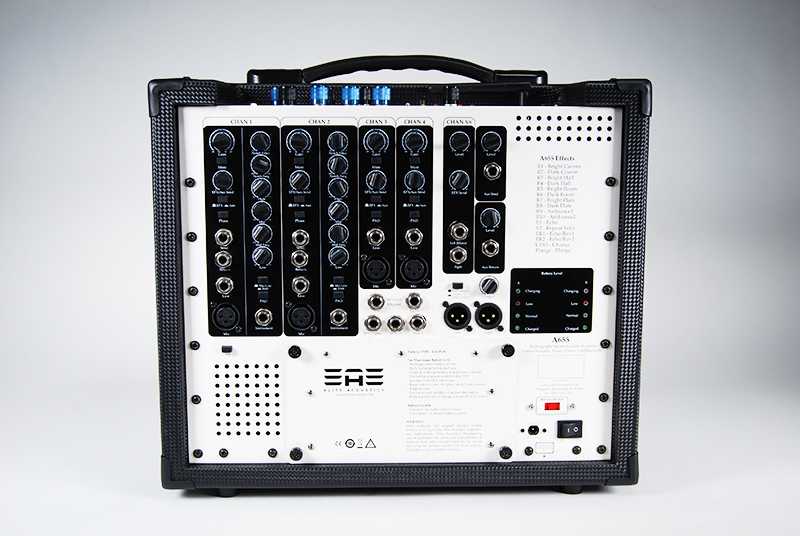 First 2 input channels come with seletable High Z input, EXF loop and extensive EQ control includes Notch and MID sweep. 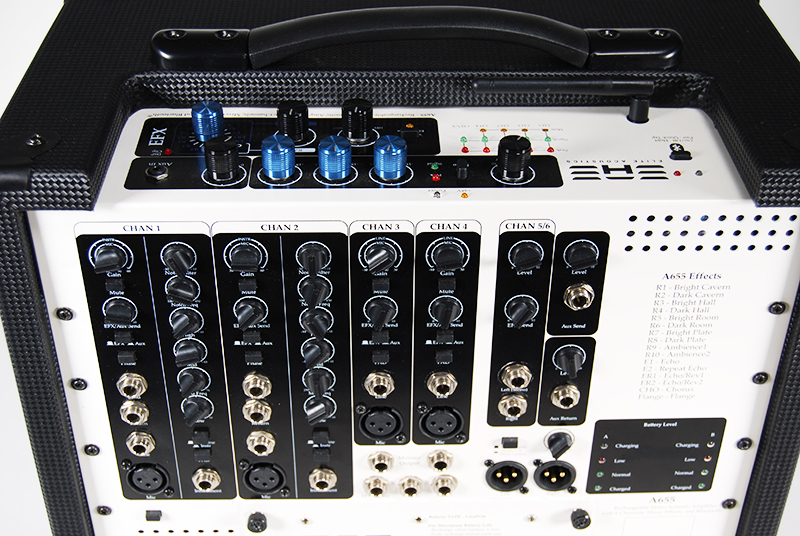 Total 4 MIC inputs, 6 Line inputs, and independent level control Digital Effects mix level for each input channel. 16 selectable effects with parameter controls include Cavern Reverb, Room Reverb, Hall Reverb, Plate Reverb, Delay and Chorus etc. Coupling with EFX loops on Chan 1/2, an Aux Mix SEND/RETURN allow for external Effect Process to be added with ease. Active crossover and Bi-AMP 2 way design drive a stereo pair of 5 1/4″ and 1″ silkdome Tweeters for superb sonic response. 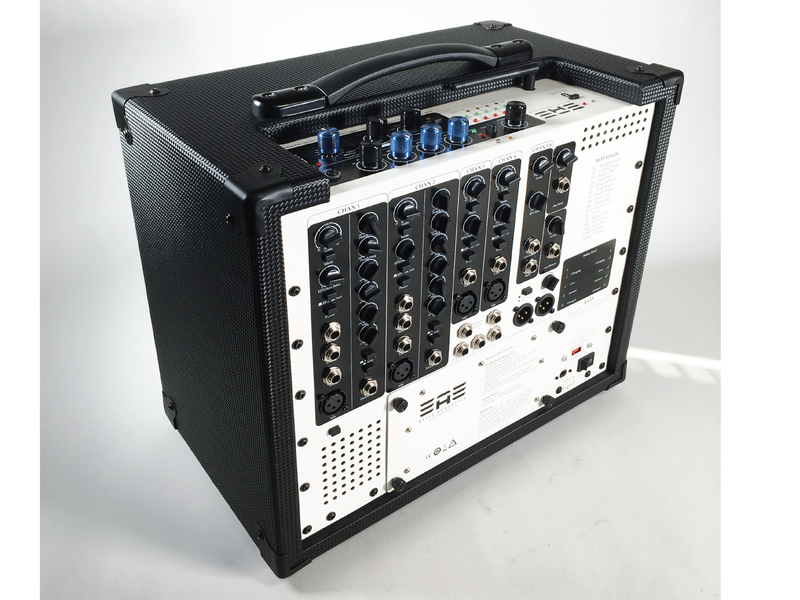 Main mix (selectable as Direct outs), Monitor mix, Aux Mix outputs offer extreme flexibilities to send to House PA or additional speakers. 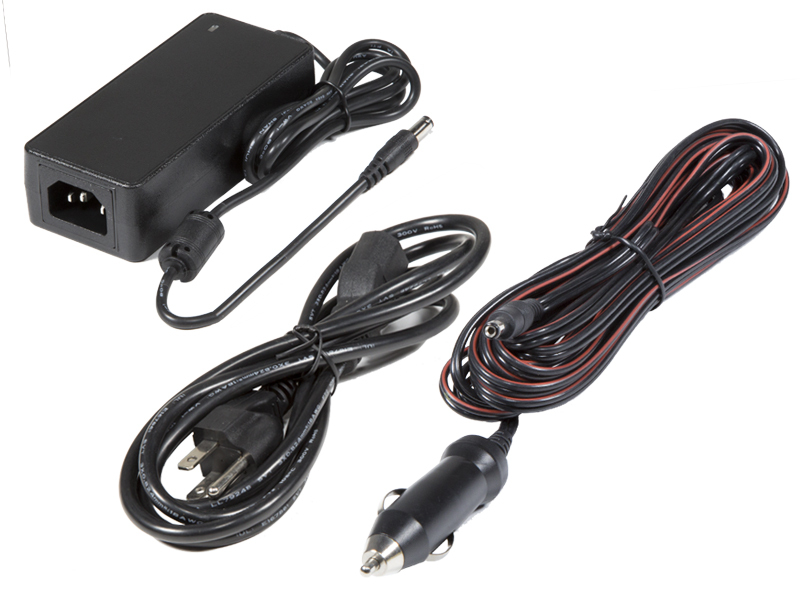 3 Footswitch control jack as available for MUTE CHAN 1/2 or EFX. Builtin 11000mAh Lithium Iron Phosphate (LifePO4) battery for longer playtime and fast charging time. All packed into a compact portable package for a convenient and quick setup to amplify your performance everywhere. 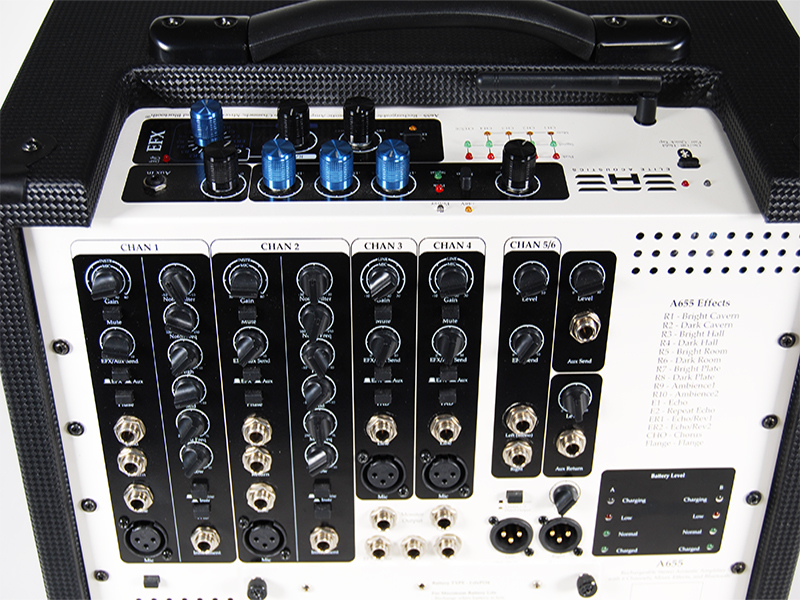 +48V Phantom Power for all 4 MIC inputs. www.eliteacoustics.com © 2017 Elite Acoustics Engineering Inc. All Rights Reserved.